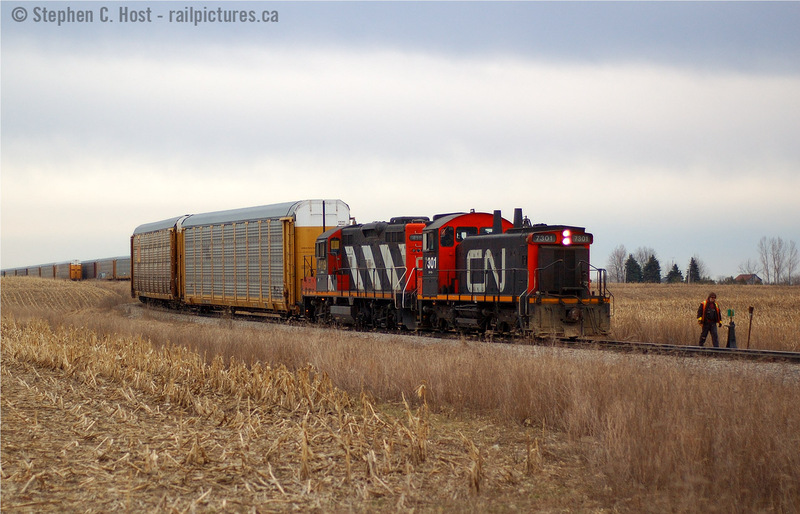 Railpictures.ca - Stephen C. Host Photo: This will be a familiar image for OSR fans – but this was a very rare sight even then – for one day only, a CN SW1200 made a brief appearance on the CN’s Ingersoll/CAMI Switcher job. This was my last shot of a working CN SW1200 until over 10 years later when 7304 would make it back into service in Hamilton. Does anyone remember the symbol of the CN CAMI jobs? I don’t ! Thank you in advance for any replies. | Railpictures.ca – Canadian Railway Photography – photographie ferroviaire Canadienne. Caption: This will be a familiar image for OSR fans - but this was a very rare sight even then - for one day only, a CN SW1200 made a brief appearance on the CN's Ingersoll/CAMI Switcher job. This was my last shot of a working CN SW1200 until over 10 years later when 7304 would make it back into service in Hamilton. Does anyone remember the symbol of the CN CAMI jobs? I don't ! Thank you in advance for any replies. Also interesting: no ditch lights either. Interesting no spark arrestors on the 1200. Funny you say that – I remember power parking in the CN yard in Ingersoll near the yard office..
From what I recall – one or two years after this photo – CN parked power in the CAMI facility and ended parking it by the yard..
Now THAT is an impressive image !! Pretty sure CN 583 was the symbol for their job out of Beachville. Power was usually parked over on the connecting track near Pemberton street.